Sarah Fernandes a 14-year-old fourth form student of the North West Secondary School, Region One is the winner of the national level Caribbean Organisation for Tax Administrators (COTA) 5th Essay Competition 2017, the Guyana Revenue Authority (GRA) said Monday. Fernandes’ essay on the topic “If I were the head of my country’s Tax Administration, what would I do to increase tax revenues to fund the Government’s development programmes?” was impressive enough to earn her 98 out of 100 marks by an evaluating panel. 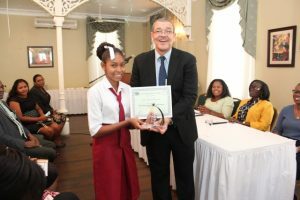 She, along with twenty-five (25) other students from schools across the country and their Caribbean counterparts, vied for the top honours after the competition was launched in March 2017. Participating schools were required to submit three essays (800-1000 words) on the above-mentioned topic. The submissions were required of students grades 9-11 and graded for knowledge and understanding of the tax administration function, the country’s tax structure and current modernisation drivers, relevance and depth of research, quality of argument, ingenuity of ideas and use of examples/ illustrations, use of proper grammar and punctuation. Evaluation was done by a panel of senior officers from the Guyana Revenue Authority (GRA) which then submitted the finalists to COTA for entries at the regional leg of the competition. 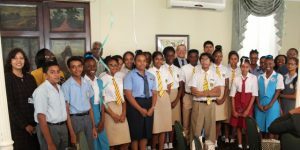 Fernandes, along with Naiome Bacchus of St. Joseph High and Crystal Wills of Queen’s College copped the respective first, second and third prizes. They received honours at a simple ceremony at Cara Lodge on Thursday, October 12, 2017. The first prize trophy was presented to Fernandes by Commissioner-General of the GRA Mr. Godfrey Statia. Prizes and certificates were also distributed by Deputy Commissioner-General Hema Khan, Head of Law Enforcement and Investigation (LEID) Fitzroy Corlette, CARICOM Representative Ms. Fiona West and Senior Education Officer Ms. Carol Benn. Mr. Statia said this initiative by COTA must be applauded since it provides the opportunity for introducing youths to taxation and also allows the GRA to garner feedback about the youths’ perception of taxation. “The entrants’ interests reveal that there may be the need to include taxation as part of the education curriculum,” the Commissioner-General said. Amidst the accolades, the pupils were encouraged to continue showing interest in reading, writing and in-depth research if they want to excel. The essay competition is a major element of the public education component of the COTA work programme which is aimed at stimulating broad interest in taxation matters.